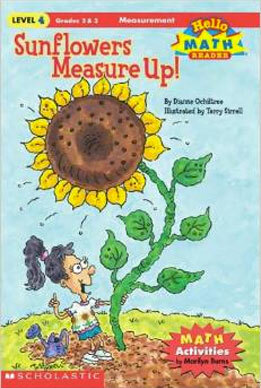 This math-oriented step-into-reading story is aimed at readers in grades 1 to 4. It incorporates the concepts of standard and non-standard measurement, along with formulating and interpreting data in a gridwork. Of course, readers will learn a little bit about gardening, too, as they follow the main character’s quest to win the class contest by growing the tallest sunflower in school’s community garden. Quirky, colorful illustrations by Terry Sirrell.